Critical swimming speed (Ucrit) predicts the maximum sustained swimming velocity that various fish species are able to sustain for prolonged periods. The objective of this study was to determine the Ucrit of Afrotropic ecozone fish, determine oxygen consumption at Ucrit and relate the resulting optimum flow requirements to effective movement through fishways under South African flow conditions. The selected fish species were Coptodon rendalli, Tilapia sparrmanii, Pseudocrenilabrus philander, Oreochromis mossambicus and Enteromius trimaculatus. Ucrit and oxygen consumption (MO2) were measured in a swim respirometer at 5-min intervals, at increasing velocity increments of 0.5 cm·s−1 until volitional exhaustion. No significant differences were seen in the Ucrit values between C. rendalli, T. sparrmanii and P. philander, but all species significantly differed from O. mossambicus and E. trimaculatus, which had the highest Ucrit (17.6 ± 1.5 bl·s−1 and 18.2 ± 2.8 bl·s−1). Size plays an important role in the swimming performance of fish, with larger fish able to sustain a greater velocity, which was specifically true for O. mossambicus in this study. Additionally, smaller fish consumed more oxygen during swimming and therefore used more energy, experiencing relative physiological strain. Based on these data, flow respirometry was shown to be a useful tool to determining prolonged swimming abilities of South African fish species, and can help inform the structure and flow rates of culverts and fishways. Swimming performance is measured as a principle trait that determines the survival of many fish species (Tudorache et al., 2008), and is critical to avoid predators, move between habitats and negotiate barriers (natural and man-made) to breed, feed or survive unfavourable environments (Smith and Sharman, 2013). It is fundamental to understand the sustained swimming ability of fish determined by calculating critical swimming speed (Tudorache et al., 2008). Critical swimming speed (Ucrit) is a commonly used method to assess the maximum sustainable swimming speed for the time interval used in the test (Peake, 2008), and represents the indicative maximum aerobic performance of a fish. Moreover, Ucrit is associated with the physiological condition of the fish and is regularly used as a welfare indicator (Carbonara et al., 2012). In addition, Ucrit plays an important role in determining the water velocity in an environment that a specific species is capable of negotiating. When swim speeds exceed Ucrit for extended periods, the metabolic demand for oxygen will be greater than that supplied by cardiorespiratory systems and hence increase anaerobic metabolism and oxygen deficit, similar to that experienced during ambient hypoxia (Barbieri, 2007; Bushnell, 1984), which will cause disruptions in homeostasis. The Afrotropic ecozone of sub-Saharan Africa readily experiences drought as well as seasons of extreme rainfall (US DOE, 2012). Aquatic systems are subject to human manipulation by the installation of structures that have the potential to impact water flow within the system and ultimately the fishes' ability to move and survive. Consequently, a key factor in the design of structures (e.g. culverts and fishways) to overcome migration barriers is to determine the fishes' swimming ability (Santos et al., 2007). Therefore, knowledge of Ucrit is important because it can illustrate the physiological capacity or 'fish fitness' of a particular species (De Peyster and Long, 1993). Importantly, these data could inform the management of water systems to determinine fish movement through these structures to improve the sustainability of inhabitant species (Bok et al., 2007). Most of the fish species in this study use seasonal local relocation within a system in order to exploit new habitats that become available during natural cyclic variations in the river system. These include breeding reaches, which aid in genetic dispersal, as well as foraging, avoiding predators and moving away from unfavourable environmental conditions (Ross, 2015). In order to support successful migration and diversity of fish species within a system, fishways need to be designed to cater for the weakest-swimming species (Garcia de Leaniz, 2008; Pon, 2008). According to Peake (2008), one practical application of Ucrit is related to the establishment of water velocity criteria for fishways and culverts. Most of the information available on environmental water flow for fish passage through fishways is based on European fish species (Peake, 2008). To our knowledge, there are no quantified data on critical swimming speed using African fish species, despite the fact many aquatic environments on the African continent are subjected to impoundments to provide water for human consumption, hydropower and agriculture. The knowledge of Ucrit and oxygen consumption of fish species can directly inform researchers and practitioners on the physiological capacity of fish. Determining Ucrit data for healthy fish populations will provide an evidence base to inform the management agencies about the performance of fish species in South Africa's aquatic environments. The aim of this study was to determine: (i) the sustained maximum swimming speed of selected indigenous fish species, and (ii) the oxygen consumption rates during the maximum sustained swimming speed. All experimental procedures were approved by the University Research Ethics Committee (Ethics number: NWU 00095-12-S4). Seven replicates per species were used; descriptive data for each species are presented in Table 1. All fish were bred in the aquarium (North-West University Potchefstroom Campus, Potchefstroom, North West, South Africa) and tested in a laboratory at the same location. The temperature selected for each individual species' swimming experiment was based on species-specific ranges set out in Skelton (2001). The experiment was done using a 5 L respirometer Loligo swim chamber (Viborg, Denmark). The swim chamber was calibrated using digital particle tracking velocimetry (DPTV) from Loligo Systems (Viborg, Denmark) to ensure the water velocity measurements were accurate. Briefly, 2 mg of green fluorescent beads were added to distilled water with a drop of detergent and then injected into the chamber and illuminated using a laser. A 3 cm area was marked to indicate the calibration image using a ruler. The beads were tracked using a 150 Hz high-speed camera (3.0 U-Eye IDS Imaging Development Systems, Obersulm, Germany) at 5-min intervals at incrementally increasing flow velocities. The DPTV software tracked the movement of the particles and the mean velocity was determined using the direction of the particles over a 3 cm area. The resultant calculation allowed for the determination of the appropriate flow velocity for each individual fish (determined by a multiple of each fish's body length). The Autoresp programme (Loligo systems, Denmark) general settings were set up for Channel 1, ambient oxygen N°1 and ambient temperature N°1. Auto-configure settings were set to manual set up and the temperature and oxygen probes were calibrated using a two-point calibration method according to Loligo AutoResp User manual (version 2.2.0). Oxygen data capture was set to calculate oxygen consumption in mgO2·L−1. The chambers were flushed with oxygen-rich water until oxygen saturation recovered to above 5 mg·L−1 between experiments, so that swimming performance was not affected. To ensure that a closed system was used the intermittent respirometry settings were set to flush for 0 s, wait for 1 s and then measure for 300 s. The total length (cm) and mass (g) of each fish were recorded prior to starting each experiment. A hard water was prepared in the lab by adding 10.80 g of magnesium sulphate, 17.28 g sodium hydrogen carbonate, 0.72 g of potassium chloride and 10.80 g of calcium sulphate to 25 L of distilled water. The medium was oxygenated for 24 h using an air diffuser stone until a minimum of 5 mg·L−1 oxygen concentration was achieved. The chamber was flushed between experiments to circulate oxygen into the chamber and to remove wastes. Fish were placed in the respirometer and swam at a start velocity of 2 body lengths per second (bl·s−1). The water velocity was increased at increments of 0.5 bl·s−1 at 5-min intervals, as used by Plaut (2000). The velocity was increased until the fish could not maintain position within the chamber. The loss of position indicated fatigue and the experiments were terminated when the fish came in contact with the opposite end of the respirometer for a period of 3 s. The critical swimming speed was calculated using the equation for Ucrit as indicated by Plaut (2001). where: Ui is highest velocity maintained for the whole interval (cm·s−1), Uii is velocity increment (cm·s−1), Ti is time elapsed at fatigue velocity (min), and Tii is prescribed interval time (min) (Plaut, 2001). At the end of the experiment, the decrease in oxygen consumption values of each individual were averaged over a 5-min phase and the linear regression was calculated. 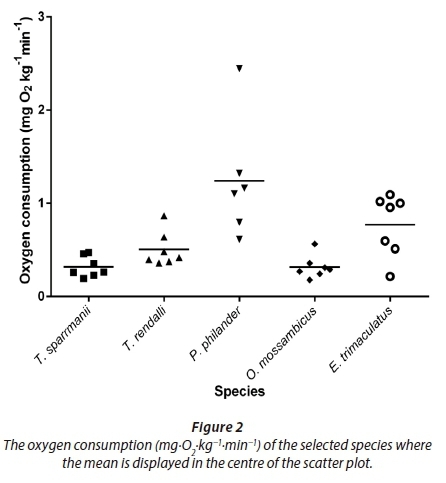 The slope was used to determine the absolute and relative oxygen content used by the fish during each time period based on mass (Svendsen et al., 2016). Significance between the various datasets (Ucrit and the MO2) was determined by using one-way ANOVA using Tukey's multiple comparison test. Significance was measured as p < 0.05. All data are presented as individual scatter points and the mean is displayed on the graph. The water velocity (cm·s−1) and Ucrit dependent on the length of the fish (cm) was plotted using GraphPad Prism (Version 6, GraphPad Software, Inc. USA), where a non-linear regression curve fit was performed using the following power equation (y = ax b). The R2 and p values were used to indicate a relationship between length and water velocity. 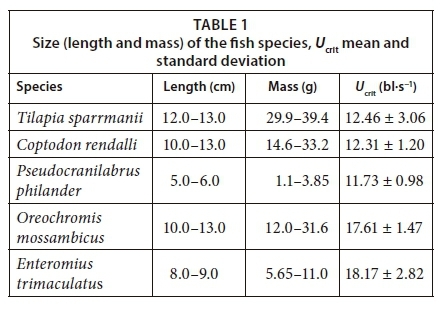 The descriptive data for each fish species are presented in Table 1. The smallest fish measured 5.0 cm in total length while the largest measured 13.0 cm; the smallest P. philander had a mass of 1.10 g while the largest fish, T. sparrmanii, had a mass of 39.0 g. Oreochromis mossambicus and E. trimaculatus showed the highest Ucrit values (17.61 ± 1.47 bl·s−1 and 18.17 ± 2.82 bl·s−1) and differed significantly from all other species but not from one another (Fig. 1). The Ucrit of T. sparrmanii and P. philander had a coefficient of variance within species of 22 to 24% while all other species ranged from 9 to 16%. Pseudocranilabrus philander displayed a higher oxygen consumption rate (4.81 mg·O2·kg−1·min−1) but there were no significant differences (p > 0.05) between this species and the other species. Pseudocranilabrus philander had one distinct outlier where the mass of the fish (1.1 g) was much lower than that of the other fish (Fig. 2). The larger the fish, the higher the velocity they were able to manage before approaching critical swimming speed (Fig. 3). Two groupings were seen, where fish less than 8.0 cm could only withstand a velocity below 90.0 cm·s−1, while fish above 8.0 cm could manage in a velocity of up to 230.0 cm·s−1. Statistical analysis revealed that O. mossambicus demonstrated a significant (p = 0.0062) relationship between water velocity and fish length while all other species did not. All selected fish species naturally occur in habitats with still to slow-flowing water, preferably surrounded by vegetation, and T. sparrmanii and C. rendalli, as well as P. philander, are well adapted to these environments (Skelton, 2001). According to Kleynhans (2003), all selected fish species have a moderate to very high preference for slow-deep and slow-shallow (< 0.3 m·s−1) habitats. Only E. trimaculatus has a moderate preference for fast-deep and fast-shallow (> 0.3 m·s−1) habitats. Oreochromis mossambicus showed a linear relationship between size and Ucrit, and E. trimaculatus are relatively hardy fish which are able to adapt to several habitats (Skelton, 1993). The results of this study are consistent with sustainable swimming speeds within the family Cichlidae (Fisher and Wilson, 2004). The latter two species showed a higher tolerance to increased water velocities compared to the other fish species and no significant differences were observed between the Ucrit values of the T. sparrmanii, C. rendalli and P. philander. Fisher and Hogan (2007) suggested that total length be utilized to show differences in swimming performance between taxonomic groups. Migrating young fish species are found to have slower swimming velocities as a result of their shorter length (Fuiman and Webb, 1988; Plaut and Gordon 1994; Plaut, 2001; Castro-Santos, 2005). Pseudocrenilabrus philander had the shortest length of all fish species and were also the species which was only able to maintain a sustained swimming speed below 90 cm·s−1, similar to flows achieved by Atlantic salmon and Brown trout (Peake, 2008). The burst speed a fish uses is used for a short duration in time in order to navigate rapid increases in flow, as seen through a V slot, while the prolonged swimming speed as tested within this study gives an indication of speeds achievable within resting pools. Pseudocrenilabrus philander in this study had a Ucrit comparable to Pseudocrenilabrus multicolor victoriae (30-46 cm·s−1) as found by Gotanda et al. (2012). The other fish species, which were larger in size, had higher swimming durations giving higher Ti values (lowest Ti 67 min and the highest Ti 150 min); an individual fish therefore swam for 2 h 30 min. 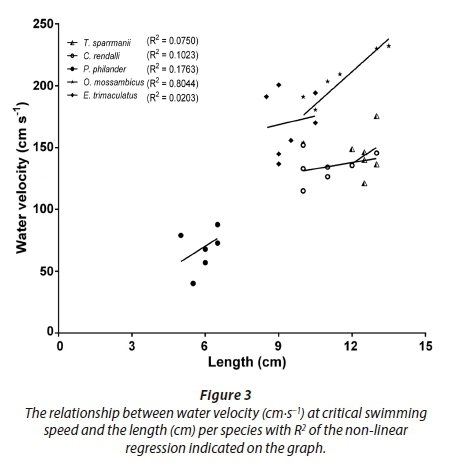 Although relative locomotor velocity in bl·s−1 is inversely proportional to body size (Ojanguren and Brana, 2003; Bellwood and Fisher, 2001), the species used in this study showed that prolonged swimming velocity in bl·s−1 is directly proportional to body size, as the larger fish species yielded higher Ucrit values than the smaller species. Compared to other species, which also have a preference for slow water, P. philander had a higher mean oxygen consumption rate. Due to the size of this species, when individuals swam at swimming speeds approaching Ucrit, their metabolic demand for oxygen was more than what could be supplied by their ventilatory and circulatory systems, resulting in an oxygen debt and increased energy expenditure, a phenomenon also seen in other smaller species, such as Danio rerio (Bushnell, 1989; Videler, 1993; Ohlberger et al., 2007). The differences in rate of oxygen consumption between species can be attributed to smaller fish (1.1-3.85 g) having limited energy reserves when compared to larger fish (Fisher and Wilson, 2004), since metabolic rate is associated with body mass by an allometric relationship (Ohlberger et al., 2007). Compared to the other larger fish, which had a lowest mass of 5.65 g, size has an effect on metabolic rate. 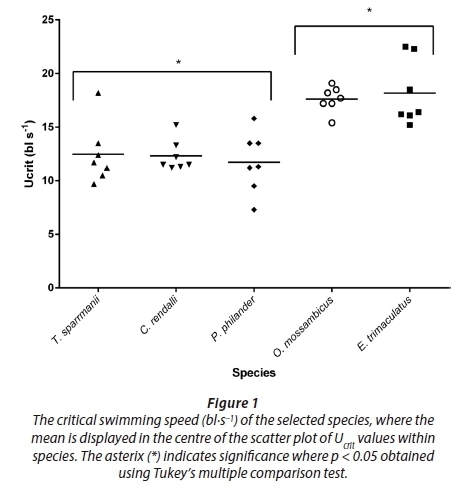 However, no significant differences were found between the MO2 rates of O. mossambicus, E. trimaculatus, P. philander, T. sparrmanii and C. rendalli, with all of these displaying extremely low rates of oxygen consumption, thus indicating very good swimming endurance and little physiological stress as they approached critical swimming speed. Two distinct swimming behaviours were observed during swimming trials; active swimming and active avoidance. The active swimming behaviour was observed in an experiment done on D. rerio by Plaut and Gordon (1994), where the species were directed downstream at lower velocities and swam with their heads directed upstream as the water velocity was increased, the fish would drift in low velocities but were quick to maintain position in the water within the middle of the chamber even when flows were increased. Enteromius trimaculatus were efficient swimmers and they displayed similar swimming behaviour to D. rerio. Both these species indicate high tolerance to increased flows and displayed good swimming ability. Danio rerio adapts by using bursts of energy to maintain position as water velocity increases and E. trimaculatus followed the same pattern and was able to maintain this swimming ability across all velocities, even up to 180 cm·s−1. However, they do not fatigue gradually, but rather terminate swimming activity abruptly and become inanimate at the back of the chamber. Although O. mossambicus individuals displayed high swimming speeds, they were able to resist swimming within the respirometer and the test subject fish had to be replaced regularly. Specifically, these fish had a propensity to drift in the current or rest against the back of the chamber using the caudal fin, rather than swim against the current and flow of the water, even when the current flow was increased further to encourage the fish to swim. This was a behaviour the fish adapted when they spent more than 10 min in the chamber at low velocities. In order to force swimming and overcome this behaviour, the direction of water flow was changed into the opposite direction and laminar flow separators with larger holes (50 mm) were used where fish felt less comfortable as their fins were able to pass into the holes. The remaining species showed similar behaviour to O. mossambicus and would swim unpredictably within the chamber and constantly touch or remain in position against the back of the chamber in order to regain position or avoid swimming. Once this behaviour pattern was noted to be commonplace, the individual was replaced with another fish to determine the Ucrit. Differences in swimming performance and swimming behaviour were established based on the overall response of the fish species. Swimming behaviour is associated with the swimming tactics adopted by the fish to survive (Peake, 2008). Swimming performance is related to water velocities wherein the fish can maintain position and orientation, as well as swimming endurance (Peake, 2008; Plaut, 2001). Tactics employed by fish to resist motion, such as resting against the back of the chamber, are not suitable to ensure survival in natural conditions or to navigate through a fishway (Bok et al., 2007). Enteromius trimaculatus have a significantly higher ability to tolerate increased water velocity flows when compared to the other species within this study, a feat which was achieved without employing swimming tactics as seen with O. mossambicus. The results of this study can therefore be compared to international fish species prolonged swimming performance guidelines, attained using a respirometer to determine critical swimming speed, i.e., the speed a fish can maintain between 15 s and 200 min. In the design of fishways the maximum burst swimming velocity of a species, which a fish can maintain for only 15 s, must be considered to enable the fish to endure the water velocity in the fishway between resting pools. Ross (2015) proposed a water velocity criterion for fishway designs in South Africa for migratory fish in the Vaal and Sabie Rivers, and suggested that the maximum water velocity through a fishway V-slot should be less than 170-190 cm·s−1. Ross (2015) did, however, note that burst forced swimming response in a laboratory setting was notably less vigorous than swimming behaviours under natural conditions where fish were more motivated. Bok et al. (2007) and Ross (2015) found that fish automatically adopted vigorous migration behaviours when a higher flow rate was placed at the entrance channel to a fishway. Therefore, the data represented within this study should be applied with caution to predict prolonged swimming speeds in a natural environment. Laboratory-bred fish are fed on artificial foods and have lower foraging and exercise demands when compared to wild-caught fish, which could be a limiting factor to this study. However, laboratory fish are not subjected to stressors such as temperature fluctuations, pollutants, predators, parasites, etc. Notwithstanding these potential limitations, the laboratory-based critical swimming speed data provide a quantitative dataset for the comparison of the swimming ability of selected indigenous South African fish species. The swimming performance of fish species in an Afrotropic ecozone can be influenced by body size, since swimming performance of larger fish yields higher Ucrit values. Oxygen consumption increases as fish experience physiological strain; a lower mass would lead to higher energy expenditure as seen in P. philander. Critical swimming speed, in conjunction with metabolic demand, has proven useful in determining laboratory-based baseline data for prolonged swimming abilities of South African fish species. The authors wish to thank NWU aquarium for supplying the fish. The authors collectively designed the study, performed the measurements, analysed the data and drafted the manuscript.